Ah, Italy and pasta. Overdosed a bit on that today, as on other things, such as a wonderful invention of croissants filled with Nutella that the hotel serves for breakfast. Seriously. 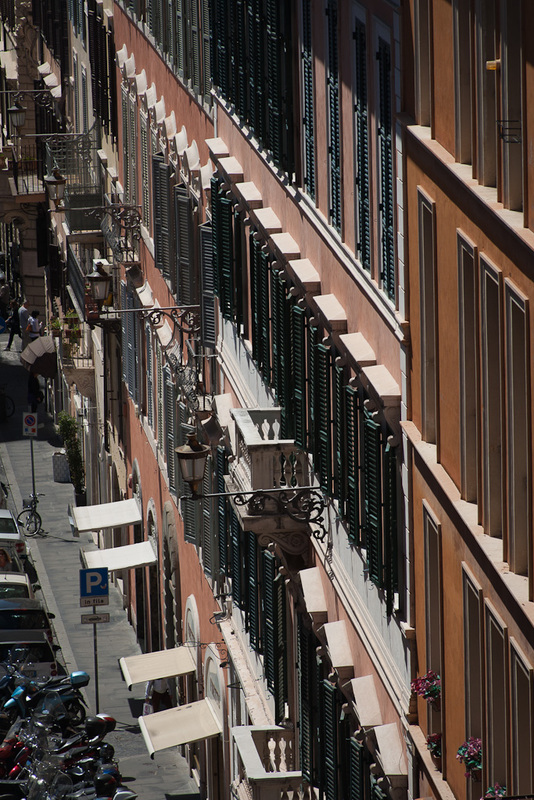 The photo was taken at Campo dei Fiori. I particularly like the rainbow coloured pasta; certainly have never seen the like of that before. 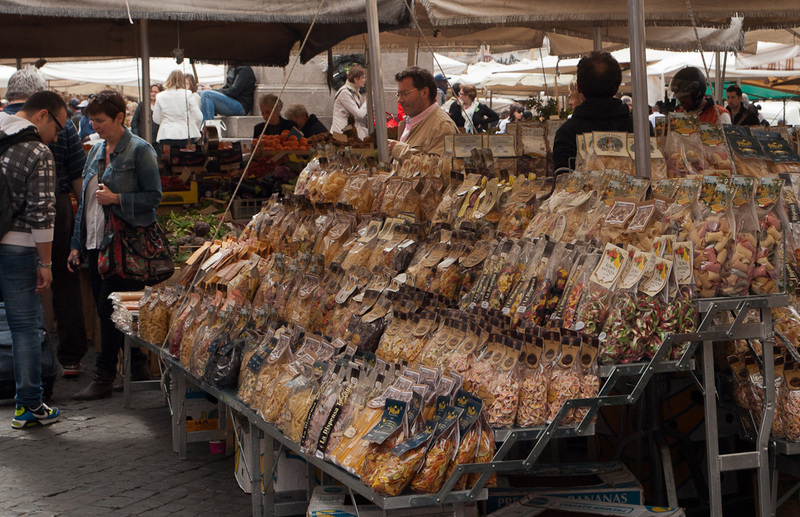 I got there by meandering from the hotel towards the Tiber River, Via Giulia, Palazzo Farnese and found this market. A bit more meandering via Piazza Navona (with mellow jazz) and the Pantheon, brought me to the lunch objective: Matricianella in Via del Leone. I indulged in bucatini all’amatriciana – slippery thick spaghetti-like pasta in tomato sauce with bacon. It was a miracle I managed to not cover myself in tomato sauce. Tonight I had dinner at Il Molo in Via del Castelfidardo (every time I see that name I have to think of Tintin and La Castafiore) and had spaghetti alle vongole. Yum. Far too much food, too much wine (the waiter poured this massive glass of house wine) and finished off by sorbeto al limone and a glass of grappa on the house. But I have worked hard for it and must have walked nearly six hours through Rome today. After lunch I walked to the Vatican, along the river and the Castel Sant’Angelo. I dutifully lined up to see the Basilica di San Pietro, as after all that is what you do when in Rome. I know it’s fabulous and extraordinary, but if I’m really honest, it didn’t move me one little bit. I followed that by a visit to the Vatican museum, in particular to see the Sistine Chapel. The Vatican museum – oh, the horror, the horror. This is my idea of hell: hundreds, if not thousands, of rude and uncouth tourists, shuffling and pushing their way to the Sistine Chapel to tick off something on their guidebook-inspired list. I’m no better and became one of them, shuffling along with this insane mass of people. The Romans must hate us tourists, except for the money we bring. Both in San Pietro as in the Chapel people completely ignored the request for silence. I am not a believer myself, but is it really that hard to respect a house of worship? Anyway, I have ticked this off my list and can return to doing what I like best: meandering through the city, soaking up the atmosphere and taking pictures. Foro Romano and Trastevere tomorrow. This morning I arrived in Rome, glad to escape Singapore’s humidity, but missing its efficient immigration when I realised Rome isn’t quite that organised at the airport, or anywhere really. After 12 hours on a plane that left well after midnight, I wasn’t feeling too flash, so after settling into my room and having a shower, I launched myself into Rome, walking first to the gardens of the Villa Borghese and following these to the Villa Medici. Can someone explain to me how the French get all the gorgeous buildings in Rome: Alliance Francaise in Villa Medici, Embassy in Palazzo Farnese? I suspect it has to do with old popes. From Villa Medici I arrived at Tourist Central, but not before indulging in a little gelato at Ciampini. From Piazza di Spagna the next tourist stop was the Fontana di Trevi. Very pretty, would have like to do an Anita Ekberg moment, but wasn’t wearing the right clothes. Have found the perfect pair of sandals for a very reasonable price and it couldn’t have been better timed, as my feet were ready for a sandal swop before walking to Santa Maria Maggiore and then back to the hotel for a quiet dinner and an early night.